Frank Vander Linden is singer and guitar player of the Belgian band “De Mens” and as Frank Vander Linden solo. When his sound technician advised him to look into getting a microphone of his own, he fell in love with the Shure KSM8 after having it used on their theatre tour. FACE gave Frank a nice present in their home studio in Bierbeek. “De Mens” is a Belgian rock band, formed in 1992 who mainly make Dutch songs. The band consists of four members: Frank Vander Linden (vocals, guitar), Michel De Coster (bass guitar), Dirk Jans (drums, vocals) and David Poltrock (keyboards). Sound technician, Tom Janssen, advised Frank to look for a microphone of his own and after having played some shows with the Shure KSM8, FACE provided him with this revolutionary dynamic microphone for his peronal use. The Shure KSM8 is the first ever dual-diaphragm dynamic handheld microphone specially suited for high-end vocal reproduction and sound-reinforcement control. The Dualdyne cartridge eliminates proximity effect, masters off-axis rejection and provides signal clarity and feedback control. During their theatre tour, Frank was using a demo unit of the Shure KSM8. After their first concert, Frank was very excited about the good sound of the microphone. Their theatre tour consists of two parts; an acoustic part and a more “rock and roll” part. The KSM8 is able to make both parts sound great. Frank chose the KSM8 with a brushed nickel finish because it gives him a seventies feeling. “De Mens” will be using the microphone at its upcoming festival performances and after summer, they will go back to the theatres. Anyone who would like to attend one of their festival performances can visit the following festivals or take a look at www.demens.be. 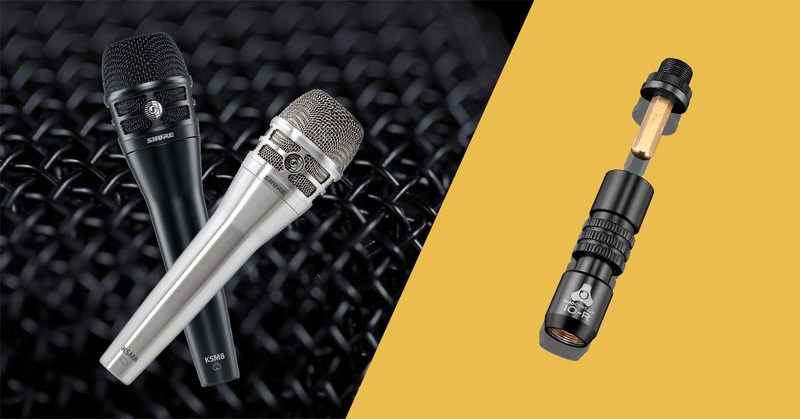 ‍Buy a Shure KSM8 and get a Triad-Orbit Retro-fit Quick-Change Coupler for free. Buy a Shure KSM8 and get a Triad-Orbit Retro-fit Quick-Change Coupler for free. The KSM8 Dualdyne Cardioid Dynamic Vocal Microphone is the first-ever dual-diaphragm dynamic handheld microphone specially suited for high-end vocal reproduction and sound-reinforcement control. The patented Dualdyne cartridge virtually eliminates proximity effect, masters off-axis rejection and provides signal clarity and feedback control. The exclusive IO Quick-Change Coupler is standard equipment on all TRIAD Stands and ORBIT Booms. To utilize the revolutionary IO functionality on your existing weighted studio-quality stand, you will need to purchase an IO-R Coupler. IO effortlessly captures booms and mics with ease and assurance. ‘On-the-fly’ hardware swaps are now a reality, replacing the tedious task of threading booms and mic clips on and off. Retrofitting conventional mic stands and boom arms with MICRO-R and IO-R aftermarket components provides an instant upgrade in functionality. Live sound and recording professionals will easily recoup their investment in MICRO and IO technology by realizing instant savings from reduced set-up and tear-down times. This promotion will start today and will end at May 31, 2016.